Oscar Pistorius Gets 6-Year Prison Sentence In Girlfriend's Murder : The Two-Way Reeva Steenkamp's parents were in court to hear the sentence; afterward, they told reporters that nothing would bring their daughter back. 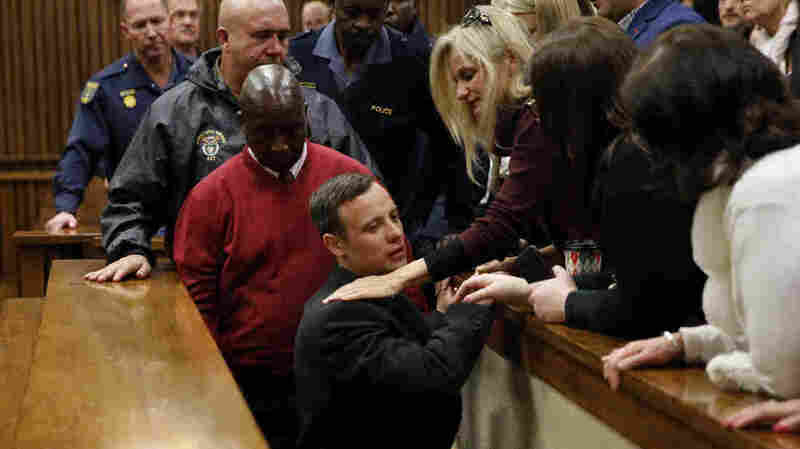 Oscar Pistorius is embraced by family members as he leaves the High Court after being sentenced to six years in prison for the 2013 murder of his girlfriend. A South African judge sentenced former Olympic athlete Oscar Pistorius to six years in prison Wednesday, imposing punishment for the 2013 killing of Reeva Steenkamp, Pistorius' girlfriend who was shot through a bathroom door in his house. The sentence is less than half of the 15-year minimum term Pistorius had faced. In announcing the sentence, Judge Thokozile Masipa cited "substantial" mitigating factors in the case of the double-amputee athlete, saying that a long jail term "would not serve justice." Steenkamp's parents, June and Barry, were in court to hear the sentence; afterward, they told reporters that nothing would bring their daughter back. Steenkamp was locked in the bathroom when she was killed on Valentine's Day in 2013. "Pistorius has always maintained he mistook his girlfriend for an intruder," NPR's Ofeibea Quist-Arcton reports, adding, "Prosecutors earlier indicated they would appeal any sentence under eight years imposed on the double amputee athlete." Before announcing the sentence in court today, Judge Masipa said that Pistorius' life has been changed forever. She added, "I am of the view that a long term in prison will not serve justice in this matter. The accused has already served 12 months imprisonment. He is a first offender... and he is not likely to reoffend." For Pistorius, the prison sentence is a sharp turnaround from last summer, when a parole board recommended he be released under supervision after having served one-sixth of a five-year sentence he received for culpable homicide, a charge similar to manslaughter.